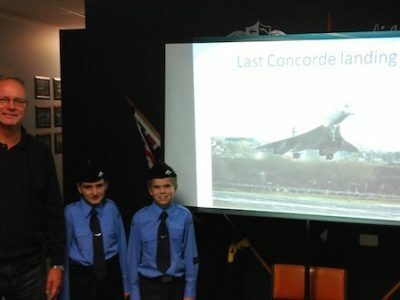 Parafield Squadron of the Australian Air League recently had the opportunity to learn about the world’s fastest commercial aircraft with a special presentation on the Aérospatiale-BAC Concorde by former engineering manager of the British Airways Concord fleet, Mr Claud Freeman. In a special one-hour presentation, Mr Freeman spoke to the cadets, officers and parents of Parafield about the challenges of keeping nine supersonic aircraft fully operational for the 3.5 hour transatlantic flights from London Heathrow to New York-JFK. He also spoke about the sadness of investigating the Air France tragedy in July 2000, and how he supervised an extensive modification program to get Concorde airborne again after its grounding. When the Concorde was finally retired in 2004, Claud flew on the very last flight into Filton – a UK airfield in Bristol where the aircraft was first developed 40 years earlier. Oscar left British Airways shortly after arranging the distribution of the Concordes to various museum and he now lives in Adelaide where he works as General Manager Australia for TAE.